Description: Sexes similar. 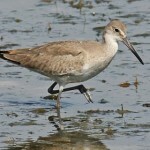 Chunky, short-legged sandpiper. Breeding adults are mottled gray-brown above; face, neck, breast and sides are reddish. Moderate sized bill, with bill being as long as the head. Winter plumage is pale gray above and white below. Juveniles similar to winter adults; also have buffy tinge on breast. 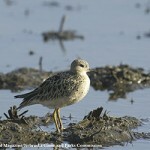 Habitat: Migrating birds can be found on mudflats and sand bars. Where in Nebraska: Rare spring and fall migrant throughout state. Mostly absent in the west. Most sighting records are from Lancaster, Sarpy, and Douglas Counties. 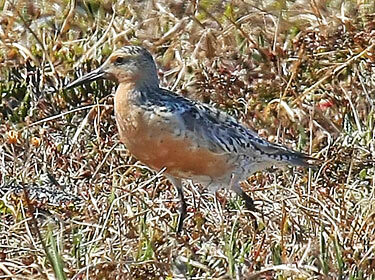 Unlike many birds, Red Knots do not regurgitate any hard parts from their diet; rather they pass it through their feces. 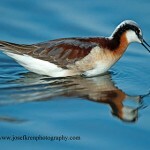 Admiral Perry’s expedition to the North Pole in 1909 discovered the first nest of this species. Common name comes from “knut” call.